Guest Slot: Should Russia be hosting? 2 Comments on Guest Slot: Should Russia be hosting? WHEN Russia was awarded the hosting rights to the 2018 FIFA World Cup, it wasn’t totally unfair to dismiss the reaction – particularly that of the English – as sour grapes. After all, there was a certain expectation among the England camp that it was their moment: a feeling of entitlement that it was their chance to win the tournament in the home of football once again. Olaf Peter Jensen addresses the elephant in the room. Fortunately for Russia – but unfortunately for England’s chances of seeing the decision somehow overruled – the whole event was overshadowed by the ludicrous choice to send the 2022 edition of the World Cup to Qatar. As a result, few people at the time questioned whether Russia was a suitable host for the competition. g won, as the Soviet Union, the very first European Championship in 1960; at the time they were captained by Lev Yashin, a Russian-born goalkeeper widely considered the greatest of all time. They’ve been innovators, too. It was a Russian, Victor Maslov, who invented the 4-4-2 formation as manager of Dynamo Kyiv in the 1960s. His team was among the first to utilise the pressing game, and implemented new developments in nutrition and fitness to create a team well ahead of its time. But Russia’s national significance can perhaps be overstated: the country’s cultural dominance within the Soviet Union means it’s easy to forget that the nation’s best players, best managers, and best clubs were often not Russian. Of the three Soviet players to be awarded the Ballon d’Or, two – Oleh Blokhin and Ihor Belanov – were Ukrainian; the very best Soviet manager, Valeriy Lobanovskyi, was born in Kiev; and the most formidable club in the Soviet Union were Dynamo Kyiv, who won 13 Top League titles and two UEFA Cup Winners’ Cups. And today, you’d struggle to name a single Russian player. It is telling that, since the dissolution of the Soviet Union, the Russian national team has never qualified for the knockout stage of the three World Cups it has played in, and only done so once in the Euros. Its clubs have fared better: CSKA Moscow and Zenit St. Petersburg won the UEFA Cup in 2005 and 2008 respectively, and make regular appearances in the Champions League, but it’s fair to say that they no longer hold the cachet they once did. But these days it’s not the clubs that strike fear into the hearts of the top European clubs, but the fans – and this is where the trouble begins. Racism and violence among Russian football fans has been under heavy scrutiny, particularly in the wake of an unprecedented level of organised hooliganism during Euro 2016. In Marseille and Lille, Russian thugs, wearing masks and carrying improvised weapons, clashed with England fans with an almost military level of planning and organisation; dozens of supporters were injured, and two were left in a coma, having been beaten by thugs wielding iron bars and throwing chairs. The violence made for harrowing viewing. Documentaries have since followed gangs of thugs into the Russian woods, where hyper-masculine, Fight Club-esque punch-ups are held to train new generations of hooligans. The groups, heavily linked with Russian nationalist and neo-Nazi ideology, fight not just for the love of violence – a fixture at Russian Premier League matches – but also for national pride. They see the mockery and derision of loutish, lippy, provocative English fans as another symptom of the emasculation of their country at the hands of the decadent West. The solution is obvious: all out war. Although hooliganism can be contained by the Russian authorities, the pervasive and often violent racism is more difficult to overcome – it’s a particular concern with five African nations and dozens of black players from around the world competing in the tournament. Black players are regularly subject to abuse at Russian league and international matches. For instance, Brazilian legend Roberto Carlos had bananas thrown at him during his spell as an Anzhi Makhachkala player, and the Ivorian Yaya Touré received a hail of monkey chants from CSKA Moscow supporters when they played Manchester City in 2013. His protestations to the referee were fruitless against the crowd. Racist abuse and violence is already common in Russia, targeting black and Muslim individuals. Furthermore, oppressive anti-LGBT laws and and intense, rampant homophobia make attending the tournament a risk for LGBT supporters. 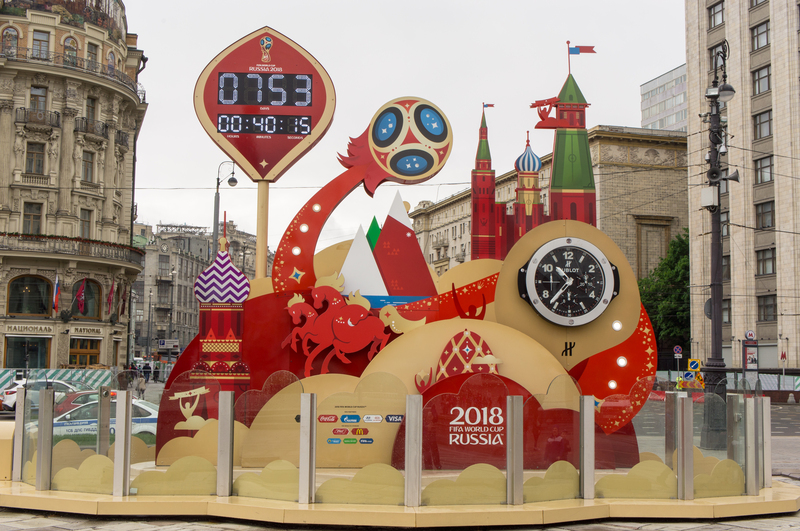 With millions of fans from all over the world set to attend the World Cup, how seriously can we take Russian assurances of safety and security for its guests? No FIFA official could have cast his vote in 2005 without knowledge of the racism, the homophobia, the violence and the hooliganism that pervade Russian football culture and wider society. It would take a particularly nasty, morally bankrupt individual to happily back Russia’s bid for the tournament, knowingly putting fans in danger. Bribery and corruption seem to present something of an explanation; ever since the vote was concluded, football officials have been liberal with their allegations. But, when it comes to Vladimir Putin’s totalitarian mafia state, it’s difficult to discount. After all, evidence has since emerged of a massive, state-sponsored doping operation, that has implicated over a thousand Russian athletes, seen 51 Olympic medals stripped from them, and had the country banned from both the 2016 Paralympic Games and the 2018 Winter Olympics. In the years following the decision, Russia has invaded two countries, propped a brutal dictatorship in Syria, interfered in elections and funded populist groups across the Western world, poisoned two people on the streets of Salisbury, created a dictatorship and burgeoning cult of personality, quashed dissent and murdered opposition leaders and journalists. They hold international law in contempt, they celebrate corruption as a national pastime, and they laud the violence and racism of their football fans. And beyond all that, they’re not very good at football either. If FIFA still believe they made the right choice, how can they be taken seriously as custodians of the global game? Really enjoyed this. You’re right when you examine Russia’s attitude towards LGBT and ethnic minority rights. I was also shocked to read the country stats on journalist deaths as well. I’d be interested to know your thoughts on my blog post on the World Cup in general if you have a minute.